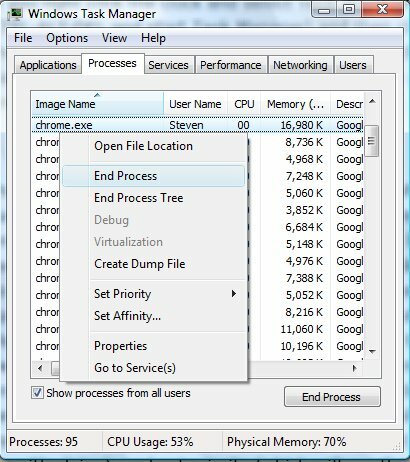 If you right click the clock and select Task Manager (or press CTRL-ALT-DEL and start Task Manager) and then click on the Processes tab, you can see all the processes and their names, CPU usage, RAM usage, who's running the process, and maybe even a description of the process. Processes are loaded by Windows and programs when you run them and Windows and other programs can run multiple processes at one time. Specifically, processes are like the executable parts of a program that must run in order for you to use a program and they each take their own memory space and CPU level to run. 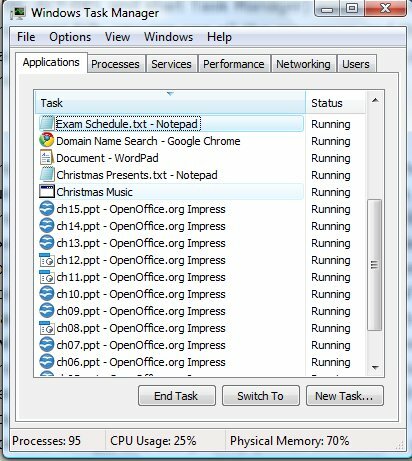 In the Processes tab of Task Manager, you can also end a process or a process tree (which usually stops the program from running), end the process tree, create a dump file (although this option is not generally used by typical computer users; only really when you're writing the program that's running and want to see how it's doing), and set priority (which will run the process on top of the others and usually cause your program to run faster with a lower chance of stalling). An example of a program using processes is Windows Media Player. For example, on the applications tab of Task Manager, you would just see Windows Media Player running. However, if you clicked the Processes tab, you would find that Windows Media Player loads more than just one process (wmplayer.exe), it also loads up wmpnscfg.exe (for network services related to Windows Media Player, such as when you rip an album, this process would automatically find the album's information so that you do not have to manually enter the names of the songs, artist, album name, etc). Windows Media Player may also load another process (mfpmp.exe), which is a "media foundation protected pipeline EXE". For more information on these processes, you could also look them up on your favourite search engine. 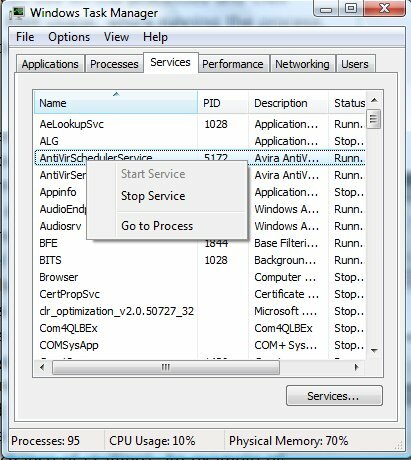 If you were to look at the services that Windows Media Player uses by clicking on the Services tab of the Windows Task Manager, you can see these services and by right clicking a service, you can choose to either run or stop a particular service. Windows Media Player itself services such as a network service, Windows Audio service, another audio service, a Windows media and video service, etc. Both processes and services help programs run and it can also be helpful to know that if you can't "End Task" for an unresponsive program, it's best to just right click that program, click on "Go to process", click "End Process" and then you program should exit. Why should I care about processes and services on my computer? It's very important to learn about processes, services, and what programs Windows starts up when it loads, because you can greatly speed up your computer by turning off services you'll never use (article on "Turning off services" coming soon), and turning off programs that you don't need but can decrease your computer's overall performance, and you can even prevent viruses and malicious software from loading (by looking up a process on the internet to see if it's bad or seeing if it's taking too much of your CPU usage, RAM space, and/or network bandwidth). Generally, programs and their processes are malicious but services aren't, because services are just like parts of Windows that run to aid other programs and provide guidelines and operating instructions for your computer. The PID number in the Services section of the Task Manager also refers to the unique process id of that process (usually only administrators and programmers will have to work with this number). Thanks for reading my article on processes and services.